Have questions that you'd like some help on? Drop us a note and we'll get right back to you. Thanks for your message... it's flying through email servers somewhere right now and on our way to us. We'll drop you a note as soon as we receive it. The ClearWater Conservancy of Central Pennsylvania, Inc, a 501(c)3 non-profit. Our mission is to promote conservation and restoration of natural resources in central Pennsylvania through land conservation, water resource protection, and environmental outreach to the community. Over the past 35 years, ClearWater Conservancy has become a leader in natural resource conservation in Centre County and a strong partner with many of our other local conservation-oriented groups. To date ClearWater Conservancy’s Land Conservation Program has protected over 6,215 acres of land through conservation easements and conservation partnerships resulting in public ownership of unique habitats and landscapes. Since its inception, ClearWater Conservancy’s Riparian Conservation Program has installed riparian buffers along more than 82,434 feet of stream as well as 38,171 feet of streambank fencing and 19 stream crossings, treated countless acres of invasive species, established our own volunteer-led Growing Native Program, and educated thousands of central Pennsylvania residents on the importance of riparian stewardship through workshops, field trips, and on-site interpretive panels. These activities occurred with the assistance of over 300 dedicated volunteers and through our diverse community partnerships. ClearWater Conservancy is not controlled by, related to, or sponsored by another organization. 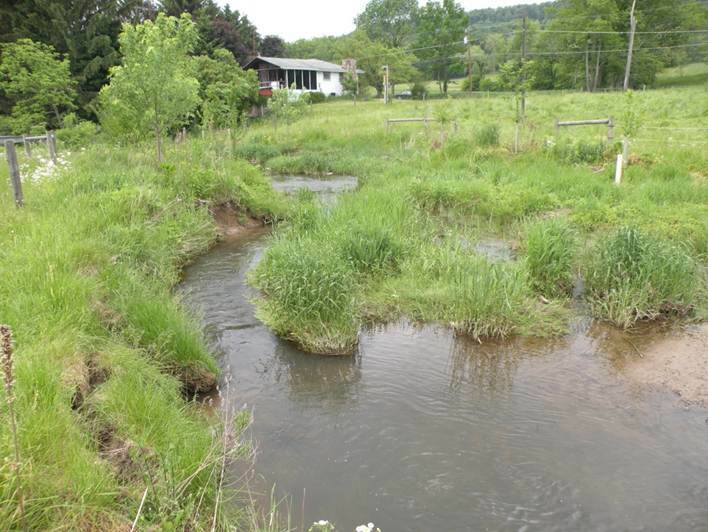 The primary goal of ClearWater Conservancy’s Riparian Restoration Program is to improve stream health by significantly reducing sediment and nutrient pollution (nitrogen and phosphorus) in central Pennsylvania streams. ClearWater Conservancy is proposing to restore 3,225 linear feet of stream on three priority farms located in the world-renowned Spruce Creek Watershed. The Hall Farm Stream Restoration Project and the Gray Farm Stream Restoration Project are both located on Halfmoon Creek, a main tributary in the Spruce Creek Watershed. The Radzwich Farm Stream Restoration Project is located on Beaver Branch, another main Spruce Creek tributary. Both of these stream sections are listed as impaired by PA DEP for sedimentation. Forested streamside buffers on these three farms will provide streambank stabilization, filtration of sediment and nutrients before they can enter these waterways, and will also eventually cool the streams by providing dense shade. ClearWater Conservancy is proposing to restore 250 linear feet of stream and half an acre of riparian buffer on the Hall Farm and to restore 300 linear feet of stream and one acre of forested riparian buffer on the Gray Farm. With funding support from The Pig Difference Grant Program, both of these stream restoration projects could be completed in fall 2016. In spring 2017, ClearWater Conservancy is proposing to restore an additional 2,675 linear feet of stream including 830 feet of streambank stabilization, two stabilized livestock crossings, 2,675 linear feet of streambank fencing to exclude livestock, and four acres of forested riparian buffer on the Radzwich Farm. 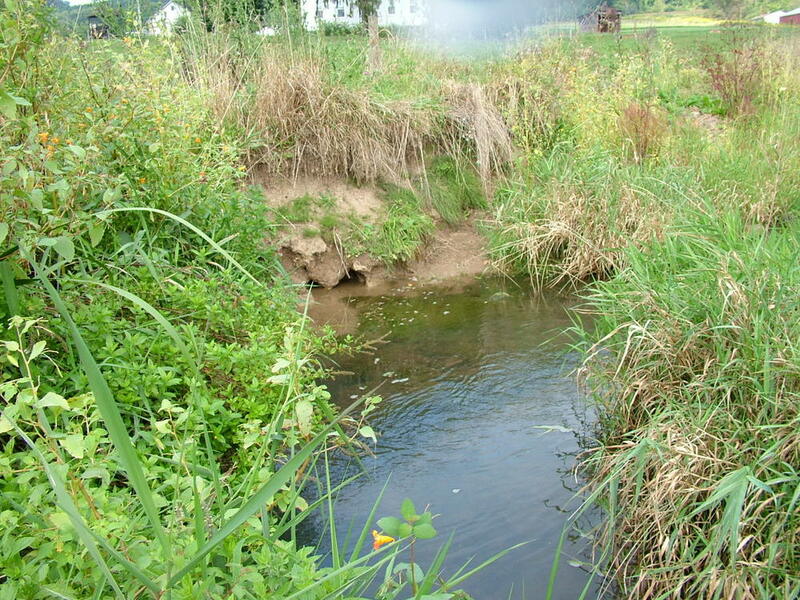 Financial support from The Pig Difference Grant Program would enable ClearWater Conservancy to complete the Radzwich Farm Stream Restoration Project in spring 2017. ClearWater Conservancy’s Riparian Restoration Program prioritizes projects in critical areas where conservation and restoration will directly contribute to the elimination of stream impairments designated by PA DEP. In Centre County, the majority of stream impairments are directly linked to agricultural runoff entering streams from adjacent farmland. A key component to restoration along sections of impaired stream is landowner cooperation. 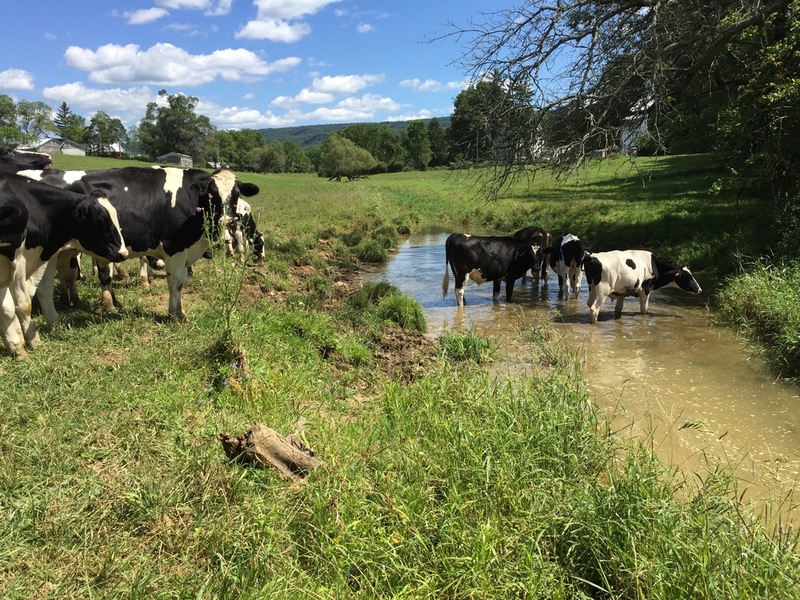 Through partnerships with farmland owners in priority areas such as Spruce Creek, ClearWater Conservancy is able to improve water quality within impaired central Pennsylvania streams. The Gray and Hall farms each have smaller sections of unstable streambanks that have recently developed and threaten existing streambank fencing and riparian buffers. Partnering with willing landowners on these farms in addition to the Radzwich property, ClearWater Conservancy will be able to restore 3,225 linear feet of stream leading to streambank stabilization, nutrient and sediment reductions, and cooling of additional sections of the Spruce Creek Watershed. Streamside buffers on the Gray and Hall farms will also protect existing streambank fencing and riparian buffers downstream. Spruce Creek tributaries adjacent to Gray, Hall, and Radzwich Farms, Port Matilda, PA.
• Confirm landowner participation (complete). • Design project and acquire permits from PA DEP (complete). • Complete conservation plan for Radzwich property (complete, provided by NRCS). • Acquire funding for all three projects (in progress). • Complete Gray and Hall Restoration Projects in fall 2016 (in progress). • Complete Radzwich Restoration Project in spring 2017 (begins in fall 2016). ©2016 New Pig Corporation, All rights reserved.